You can’t spend much time around Unsettling Wonder without meeting Laura Rae. Her strange, sensitive artwork graces a lot of what we do around here. That’s her rabbit and wolf (or is it wolf and rabbit?) going round in the banner up there. 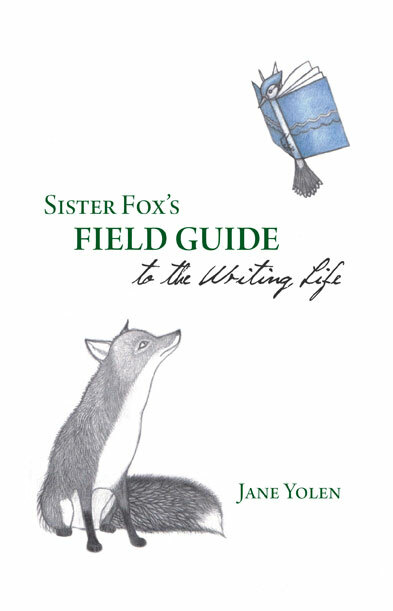 She’s drawn the covers for all our issues to date, illustrated Jane Yolen’s poetry book Sister Fox’s Field Guide to the Writing Life, and has a few other mysterious projects in the wings. Laura’s a portrait artist by profession, making her fairy tale illustrations all the more curious. We recently sat down with Laura for a chat about her work, and what makes is so–well, just so darn unsettling. UW: What got you interested in fairy tales as a visual art form? LR: I grew up as the daughter of an Antiquarian book dealer, so from a very young age there were always lots of beautifully illustrated, old fairy tales around. I was fascinated by their intricate and often weird illustrations. At art school, my work tended to be a bit surreal, occasionally dark and often with a story in it somewhere. I think early exposure to so many classic fairy tales had something to do with the themes that kept recurring later on in my own drawings and paintings. You don’t call yourself an illustrator as such, and yet there’s often a narrative running throughout your work: how do you approach illustration, then, as a non-illustrator? I specialised in Fine Art at university but I don’t think that means I have to remove myself from illustration. I approach illustration mostly through instinct, I get a feel for the writing and act on that with lots of very rough sketches. I choose the strongest images and work for a while fine-tuning them. I absolutely love the illustration process, so it doesn’t feel like an unfamiliar discipline to me. 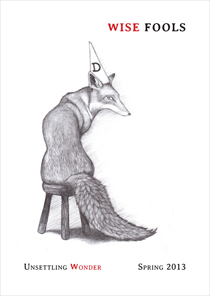 Tell me a bit about how you created the illustrations for Sister Fox, and developed this character and-well, this story within a story really. The poetry of Sister Fox brought with it so many visual possibilities that the challenge was focusing on a single idea and running with it. I rejected many complex sketches and developed only two simple characters, one being the fox and the other a sort of book and bird hybrid. These characters had relationships both with one another and with the poems. They were stripped-back and drawn only in pencil, but I think simplicity can work with poetry. Much of the enjoyment of reading a poem is forming your own conclusions as to what that poem means, so there is often less need for very complicated illustrations. I think at least some of our readers know that you’re Scottish, living and working in the kingdom of Fife, in and around St Andrews where we’re sort of headquartered. How has living in Fife influenced your artwork, positively and negatively? The peace and quiet of living in the country allows for a lot of thinking space, which has a very positive effect on my artwork. The only downside is you usually have to travel to see the sort of International Art exhibitions you would find in more urban environments and seeing lots of new Art is always beneficial to your creativity. Are there any fairy tales or folktales you’re particularly keen to illustrate? I’d like to illustrate stories that I suppose could be described as Angela Carter-esque, where perceptions of female characters are altered. I’m also very interested in tales which are very deeply rooted in cultures, ethnic folktales from around the globe, both traditional and re-tellings. What do you see as the most important function of the illustration for the story? The most important function would be to enhance the reader’s connection with the story. Who do you think are the three best artists who depict folktales and why? This changes roughly every week for me but for today I’ll say Paula Rego for her creepy quirkiness, Audrey Niffenegger for her strange and wonderful portrayal of female characters and John Bauer for his exquisite use of composition. There’s an eclectic mix for you. Thank you for this interview. I’ve been curious about Ms. Rae and her work since I first laid eyes on the UW logo. Unsettling is right, in the best of ways!